Another standard that King Cole struck gold with during the late 1940s was “Route 66,” which was composed by a gentleman named Bobby Troup. In the hierarchy of the Great American Songbook, the argument could be made that the unassuming “Route 66” has fared better over time than the massive hit “Nature Boy,” however it really doesn’t matter much. Troup scored another, much more modest hit in the 1950s with “Their Hearts Were Full of Spring,” recorded by the Four Freshmen. This song was later covered, re-covered, and covered again with new lyrics by The Beach Boys, who ultimately sold more copies than the Freshmen that Brian Wilson idolized. The odd, trivial tidbit here is that years after finding huge success independently as writers or arrangers for Nat King Cole, Frank DeVol and Bobby Troup found their careers intertwining a few times. First, Troup became a feature vocalist in DeVol’s orchestra. DeVol was a highly discerning musical expert, and recognized Troup’s vocal skills. Troup, for his part, always sought the limelight as a soloist, and made a few records over the years. His voice was excellent, but arguably didn’t have the “character” that would set him apart as a hit soloist. In DeVol’s “mood music” and easy listening interpretations of popular song, a soloist wasn’t needed, so Troup filled his role perfectly. Prior to his years as a vocalist for DeVol’s orchestra, Troup led his own band called “The Troup Group.” In 1955 he was hired to provide the music for a new television show called Musical Chairs, a sort of name that tune/music trivia game show. Troup starred with vocal impressionist Mel Blanc, and Capitol founder/songwriting great Johnny Mercer as one of the panelists. 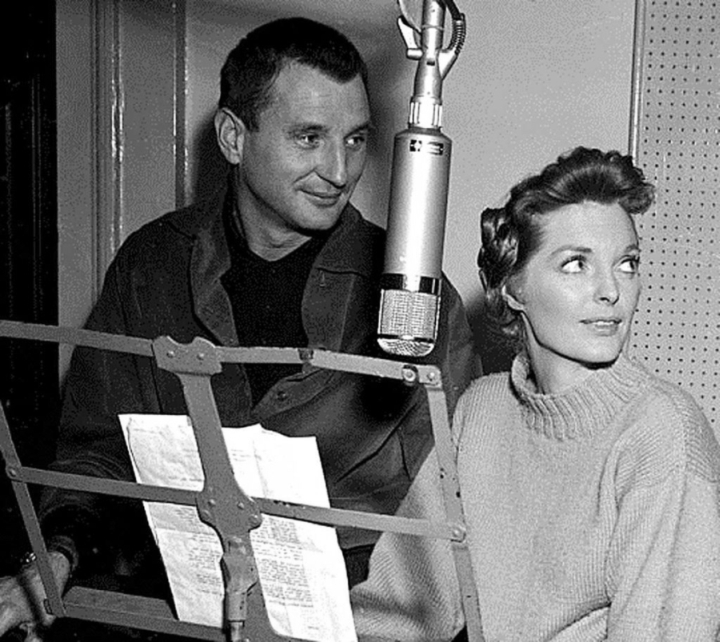 Bobby Troup was also a successful record producer in the 1950s, directing the recording of “Cry Me a River” for Julie London, who was recently divorced from TV impresario Jack Webb. “Cry Me a River” peaked at #9 on the national charts, and sold millions of records. Troup and London later married, and remained married until he died in 1999. A Hollywood rarity — it must’ve been true love. London was one of the most popular vocalists of the mid-1950s, putting five albums on the charts from 1955-1957 alone. Oddly enough, London’s voice was not as strong as Troup’s, but she had a “smoky” quality that gave her a unique sound — and solo stardom that eluded her husband. Later in his career, Troup starred opposite his lovely wife on Emergency! from 1972-1977. The show was owned, created, and produced by none other than Jack Webb, who had a very cordial relationship with his ex-wife. (The Hollywood of today could really take a few lessons here). It was also in the 1970s that Troup’s daughter Ronny Troup began a co-starring role on My Three Sons as Chip Douglas’ girlfriend/wife. The show — which of course opened and closed with DeVol’s theme — starred movie great Fred MacMurray. MacMurray’s film career began in 1929, and he starred in a number of huge films from the 1930s-1960s. One of MacMurray’s most notable films was 1944’s And the Angels Sing, in which he had the starring role. The movie was inspired by Benny Goodman’s chart-topper from 1939 of the same name. The song “And the Angels Sing” was written by Ziggy Elman and — don’t get ahead of us here — Johnny Mercer. MacMurray’s co-star in And the Angels Sing was Betty Hutton, one of the top pop vocalists of the 1940s. Hutton was one of the first artists to sign with Johnny Mercer’s Capitol Records, but later left for a better deal with RCA. Her first huge hit with Capitol “Doctor, Lawyer, Indian Chief” rocketed to the top of the national charts in late 1945/early 1946. In 1955 Betty Hutton married Alan W. Livingston, creator of Bozo the Clown. The marriage officially lasted five years, but was supposedly kaput in nine months. (Now that’s more like Hollywood.) After developing Bozo in the 1940s, Livingston became Creative Vice President at Capitol Records, and is credited with signing Frank Sinatra to that label. He’s also credited with taking Mercer’s $6 million operation and turning it into a global powerhouse, and conceiving the tower design of the Capitol headquarters. The Capitol Tower was of course known as “The House that Nat Built,” because for the first decade, Nat King Cole represented the bulk of Capitol’s sales. In 1962 Alan Livingston married actress Nancy Olson, who was working on the 1963 Son of Flubber, sequel to her earlier successful film, The Absent-Minded Professor, both of which starred Fred MacMurray. Prior to her marriage to Alan Livingston (and they remain married as of this writing), Olson was married to Alan Jay Lerner, songwriter extraordinaire. Lerner & Loewe are of course known for Brigadoon! and My Fair Lady and Gigi. One of their less successful musicals was Paint Your Wagon, later made into a movie featuring the vocals of Lee Marvin. Marvin of course was the star of Cat Ballou, for which Frank DeVol received an Oscar nomination for his musical score. Nat King Cole of course played the role of Professor Sam the Shade in the movie. Although DeVol composed the score for Cat Ballou, he didn’t write the theme song. The Lee Marvin movie Frank DeVol did compose all the music for was The Dirty Dozen. The theme song from Cat Ballou was written by songwriting giant Jerry Livingston, no relation to Alan Livingston. But Alan Livingston was definitely related to older brother Jay Livingston, composer who wrote Nat King Cole’s hit, “Mona Lisa” with lyricist Ray Evans. Jay Livingston also composed “Whatever Will Be, Will Be (Que Sera, Sera)” for Doris Day, and Christmas standard “Silver Bells.” In terms of television, Jay Livingston penned the memorable themes to Mister Ed and Bonanza. Frank Devol, naturally, made a guest appearance on an episode of Bonanza. We mentioned The Dirty Dozen, for which DeVol composed the soundtrack. Donald Sutherland had a starring role in it, as well as the film version of M*A*S*H. Bobby Troup played a small role in M*A*S*H, one of his final movie roles, driving Sutherland and Elliott Gould around in a Jeep. This of course before Troup’s starring role in Emergency!. Incidentally, actress Dawn Lyn was a guest star on Emergency!. Prior to that, she gained fame as the character Dodie Douglas on My Three Sons. Did we mention…ah, never mind. Frank DeVol may have written the soundtrack, and Bobby Troup may have played the roles, yet they played but a small role in how television re-shaped America during the 1950s — changes that are still with us today. A book called As Seen on TV: The Visual Culture of Everyday Life in the 1950s by Karal Ann Marling is an excellent read — not a dry history book or study, but an interesting ride through the past, revisiting a day gone by. You’ll find this book impossible to put down…click here for more information about this book . The link goes to Amazon.com, so you can click without worrying about all kinds of pop-ups and other wackiness troubling your computer.